These are cool approaches and they may bring in top talent. 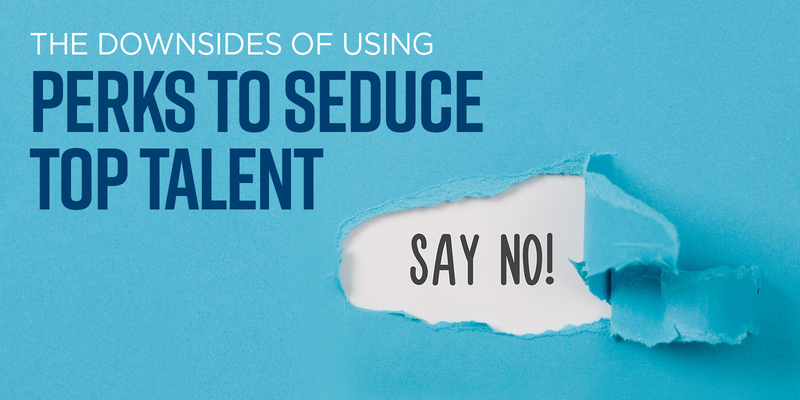 Yet, they aren’t the most effective ways to address the current talent acquisition challenge. Problem #1: They are expensive. Any one of these talent attraction approaches comes with a hefty price tag. And these “attention-grabbing” methods are easily copied by talent competitors. As a result, they quickly lose effectiveness and trap your organization into a cycle of one-upmanship requiring ever greater expenditures to stay on top of the talent attraction game. Problem #2: They are inefficient. With these methods comes the risk that you will attract the kinds of candidates who become short-term hires, easily lured away by “cooler” offers. This puts your organization into an inefficient cycle of filling the same position every six or twelve months. This cycle of inefficiency affects not only the recruiting function but also hiring managers and their teams. True and lasting success in a competitive talent market requires more than attention-getting “carrots.” It requires a talent acquisition process that is strong end-to-end—one that thoughtfully leverages technology, analytics, innovations, and best practices to efficiently and cost effectively find, attract, and select the best talent for an organization. Sourcing—Tap referral programs, passive candidates, contingent labor, and college recruiting to source scarce talent. Refine hiring manager wish lists to align with practical considerations such as labor market conditions. Where possible, look broadly for competencies and capabilities rather than narrowly seeking only specific degrees or work experiences. Attracting—Fine tune employer value propositions, recruitment marketing, career sites, social media recruitment, and the candidate experience. Leverage the perspectives of current employees to demonstrate why your organization is a desirable place to work. Promote the intangible ways your employee experience stands out (collaborative culture, meaningful work, etc.) Maintain candidate interest with an easy, responsive, and personalized application process. Technology—Use gamification, applicant tracking systems, and AI and machine learning to make hiring more targeted. Integrate applicant tracking systems with HR information systems, and customer relationship management and other business systems. Use this integration to coordinate and personalize candidate communications and to build a strong talent pipeline. Analytics—Aggregate hiring and employee data and apply predictive analytics to source and select the best candidates and improve the effectiveness of recruitment marketing. Enticing perks and hefty pay packages are nice—if you can afford them—but be sure they are backed up by a talent acquisition process that is effective from sourcing to selection.